It used to be so easy to mock the North American political process. Comedians had a field day, lampooning gaffes or silly political correctness amongst candidates and politicians seeking or in office. 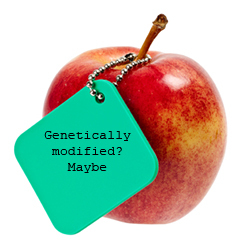 Most pols can be counted on to screw up at some point. The joker outing the naked Emperor poked fun without fear of reprisal. That all changed for Canada, yesterday. 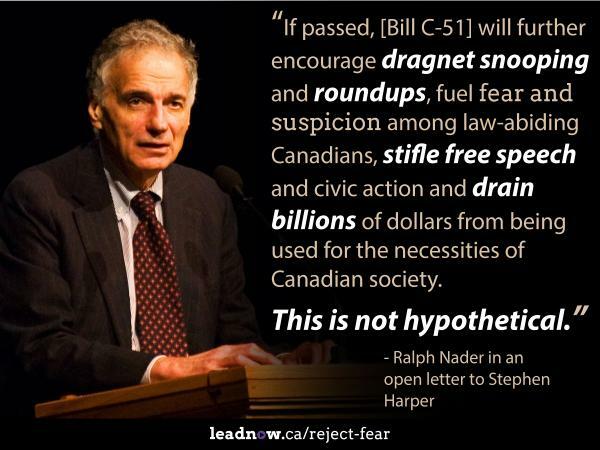 Bill C-51 – the so called “Anti Terrorist Act,” was overwhelmingly approved by the Senate, despite vocal opposition from everyone from Margaret Atwood to Ralph Nader . Over nearly a decade, Canadians have seen Canada’s world image plunge from a once lofty high the envy of the free world, to a race to the bottom. 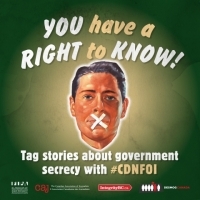 Since 2006, the Harper government has governed with an iron-fist, hidden public information and political subterfuge in cumbersome omnibus bills or simple denials, and has become the most secretive administration in Canadian history. How do you find anything funny about an increasingly militaristic and confrontational police presence that ‘serves and protects’ only those steely, unsmiling, hand-picked minions to the Prime Minister? 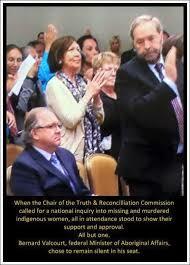 Aboriginal Affairs Minister Bernard Valcourt remained seated, silent, and cross armed while others broke out in a standing ovation at the conclusion of the six year study of the Truth and Reconciliation Commission to address the “cultural genocide” of Aboriginal peoples through Canada’s residential school system. The commission pushed for a national inquiry and adoption of the UN Declaration on the Rights of Indigenous People, and requested 94 wide-ranging recommendations. It’s very hard to find something even vaguely funny about such overt contempt. 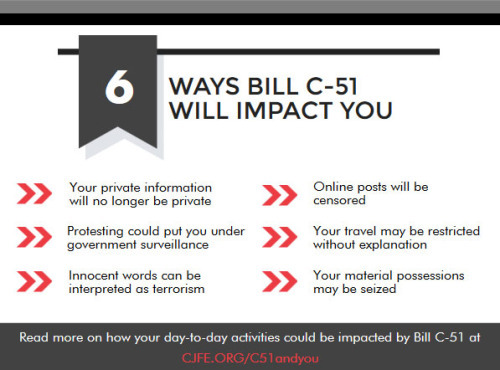 And then there’s Bill C-51 itself, an act so heinous that everyone from former prime ministers, to constitutional lawyers – and hundreds of thousands of Canadians – have begged, cajoled and screamed for it’s demise. The Bill allows the police to ignore Canadians’ rights, and rides roughshod over civil liberties. It eviscerates the Charter of Canadian Rights and Freedoms, and inherently stomps on Canadians’ constitutional rights. 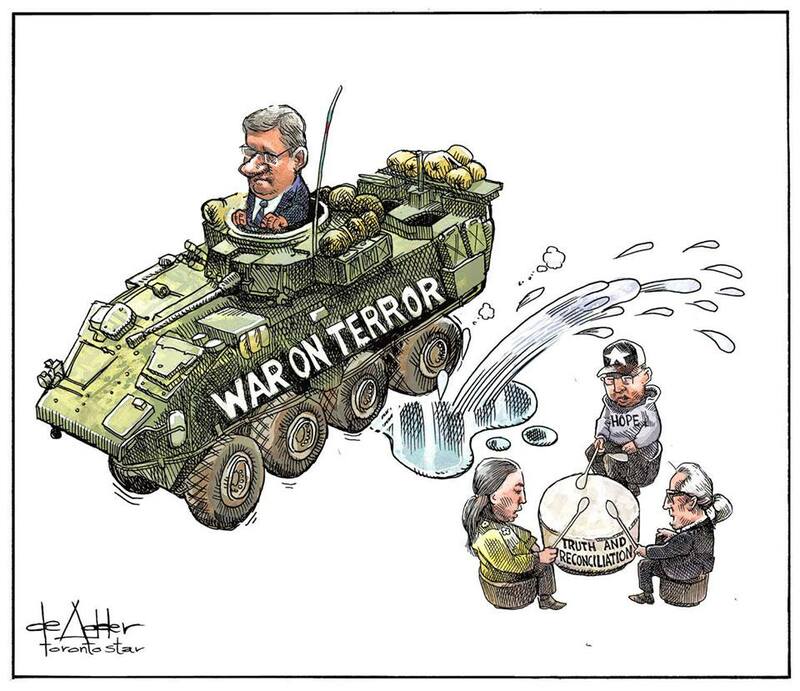 It defines ‘terrorism’ as “activity that undermines the security of Canada.” Those activities include advocacy, legal protests, threats to “public safety” and the “economic or financial stability of Canada.” It also creates a new speech-related criminal offence of “promoting” or “advocating” terrorism. Let me put this even plainer. If, for some reason, a conversation yo u have – in person, by email, or on social media – triggers the interest of ANY government official … or even a spurned lover or a miffed colleague with a grudge … you could be arrested and detained for up to seven days without charges on mere suspicion of future criminal activity. So, I’m finding it a little hard to laugh, or even smile. In what dystopia would these dictatorial and fascistic measures call for a chuckle? 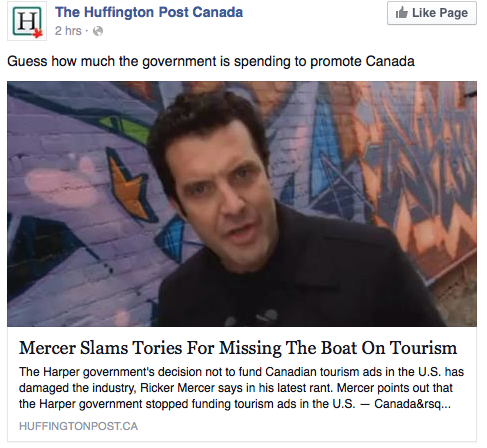 Oh, sure, we’ve got Rick Mercer’s weekly jabs and rants, but honestly – how do you poke fun at a Canadian government blindly led by an evangelistic dictator set on destroying the country he rules with an iron fist? Our only hope for a re-discovery of our political comedy mojo under such an oppressive regime is a resounding “NO!” to Stephen Harper and the Conservative Government in the coming election.